This collaboration and multi-media show will include some of each artist’s beloved and most memorable hits including, "All Along The Watchtower”, "Only You Know and I Know," "Every Woman", and "We Just Disagree" plus the rock anthem “Feelin’ Alright”, (Sittin' On) "The Dock of the Bay", "Green Onions", "In the Midnight Hour" and "Knock on Wood". 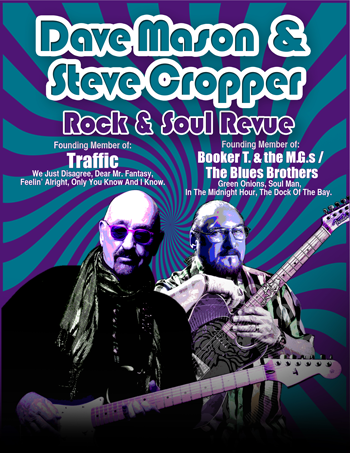 Attend sound check and meet Dave & Steve before enjoying a night of terrific music. Ask the questions you have always wanted to ask, shake hands, take personal photos and have memorabilia signed. There are only a limited number of these made available for each show. Included in the package are personal pictures with Dave and/or Steve, an exclusive VIP laminate/Backstage Pass, 8x10 color photo or a tour booklet plus a merchandise item (array of items will vary depending on availability). This VIP package is an add-on experience for ticket holders. It does not include a ticket for the show. Please be sure to purchase your show ticket first. In order to provide fans with the best possible experience, a VIP Experience with Dave must be purchased 48 hours prior to the show.